The ongoing Borneo 7's Rugby Championships 2011 is one thing that has kept me excited this weekend. Although there's no tv coverage in the Philippines, we have been following developments through Philippine Rugby Unions twitter account http://twitter.com/PhilippineRugby . And today was a breakthrough in Pinoy rugby when the Philippine Volcanoes Men’s Rugby 7's team won the Silver Medal at the 2011 Asian Men’s Rugby 7s Championships!! The Philippines entered the tournament ranked 7th in Asia and have beaten all teams on the way to play in their first ever Cup final. The Volcanoes started the day with an emphatic win over the home favourites Malaysia in a heated contest between the Southeast Asia rivals. 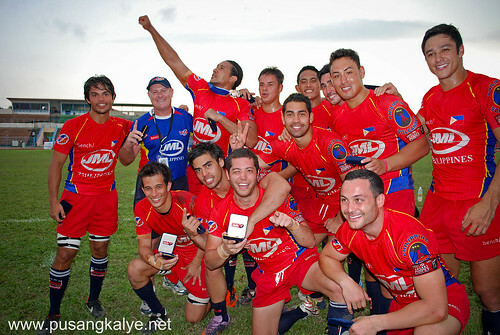 The final score saw the Philippines win by 28 – 14. The game was played with intensity from both sides and it was the “Flying Jeepney” Justin Coveney who opened the scoring for the volcanoes. Matt Saunders then scored the Philippines next try to even the game at 14 – 14 at the halftime break. The same players reversed the try scoring efforts in the second half and the Philippines knocked out Malaysia in front of their home crowd to move to the semi final against the powerhouse sporting nation, China. The Philippines had never beaten China in Rugby 7s and the teams had met on four occasions in the Asian championships in 2010 and 2011. The Philippines knew they had to combat the Chinese speed and injected Luke Matthews into the starting line up to add some pace to the outside backs. This tactic proved its worth immediately with Luke Matthews scoring the first try for the Philippines. The Chinese team replied with two first half tries and went to the halftime break with a 14 – 7 lead. The game hung in the balance until the “Hitchenator” Chris Hitch broke through some weak Chinese defense to score the equalizer just before fulltime. The game finished in a 14 all draw and the quarter final entered extra time with a golden point rule to win. The Philippines looked confident heading into the overtime period and Harry Morris was able to break away and score a try under the posts to secure a remarkable win and put the Volcanoes in their first ever Cup Final at the Asian Championships. The Asian Men’s Championships is played by the top 12 Rugby Nations in Asia and can be aligned with playing in the Asian Games. It was a remarkable feat by the Philippines to make the Cup Final and they had defeated Kazakhstan, UAE, Malaysia and China on their victorious road to success. The Finals saw the Philippines play the number ranked Rugby Nation in Asia Japan and it was always going to be a huge feat to knock of a team who all play professional rugby. The Philippines came out and fought hard against a bigger, fitter and stronger Japanese team that consisted of three islander players. The Philippines went down in the Cup Final and can be extremely proud of their efforts for ranking No. 2 in the Asian Men’s 7s Championships. the videos above shows Justin Coveney and Oliver Saunders during the practice training for Shanghai 7's with the message for all to THROW THEIR SUPPORT on the Philippine Volcanoes. Gojab guys!! !We are so proud of you!!!! no.2 is still a good spot. atlist diba may nakuhang achievement.